The Gandhi dynasty that has ruled India for most of the 64 years since independence has kept the world's largest democracy in poverty, leaders of a protest movement said on Monday as they prepared renewed rallies to target the government on corruption. A three-day fast led by 74-year-old activist Anna Hazare and a plan for thousands of people to picket the home of Congress party leader Sonia Gandhi on New Years Eve will be a test of strength for the anti-corruption movement that forced a government U-turn in the summer. "India was not destined to be a poor country, India was destined to be a developed country but corruption has kept it poor," said Kiran Bedi, a member of Hazare's inner circle. "Who has exercised corruption? The party in power, and the party in power for the majority of the years has been the Congress party and in the Congress party, the Gandhi family." India's fast-growing economy is Asia's third largest but many of the country's 1.2 billion people suffer from inadequate nutrition and have no electricity. Hazare plans to begin his hunger strike in Mumbai on Tuesday. Almost 100,000 people have signed up online to express support for a the three-day "fill the jails" protest picketing politicians homes and courting arrest. A fast led by Hazare in August brought tens of thousands of people onto the streets. After initially arresting him and dismissing him as an anarchist, Prime Minister Manmohan Singh's government caved in to his demands to quickly pass a tougher version of anti-graft legislation first proposed decades ago. The protests also triggering an ongoing debate about the nature of India's democracy. Hazare's supporters say voting in elections must be supplemented by direct pressure on politicians, while traditional parties say the protests risk "mobocracy." "If hundreds of thousands of people coming onto the street can't get their government to hear their voices, there is something seriously wrong with the way our democracy is being implemented," close Hazare aide Arvind Kejriwal told Reuters. Corruption scandals have tainted Singh's second term, with a multi-billion dollar telecom scam landing a former minister and other senior officials in jail. The focus on the Gandhi family drew criticism from the ruling Congress party, which accused the protesters of being a front for the opposition. Hazare and his aides have turned their fire on Sonia Gandhi and her son Rahul ahead of five state elections in the next two months, accusing the family of amassing too much power and watering down a bill in Parliament for a powerful ombudsman to tackle graft. The protesters are pressuring Parliament to bring the federal police force under the remit of the ombudsman, along with other demands. Parliament is due to debate the bill on Tuesday. "There are one or two people in the ruling party who run the government and run the Parliament," this is not democracy, Kejriwal said. Three of India's prime ministers since the end of colonial rule in 1947 have come from the family. Sonia Gandhi is widely considered to be at least as powerful as Singh in the current government, and her son is being groomed to lead the country in the future. 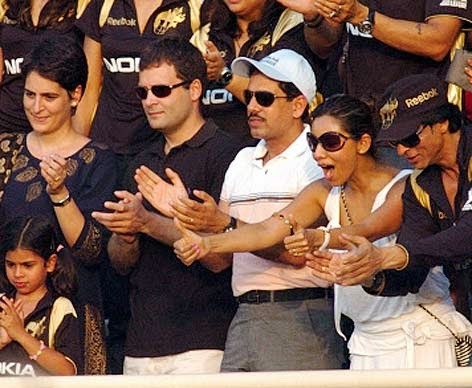 The Gandhis enjoy almost regal status, and direct criticism of them is rare outside of political campaigns. Rahul Gandhi is now running the party's campaign ahead of an election in Uttar Pradesh, the country's most populous state, in February. Hazare threatens to campaign against Congress in Uttar Pradesh and four other state elections to be held in the next two months that will serve as a barometer of the government's support half way through its term. "The entire movement has raised very serious and fundamental issues about India's democracy," Kejriwal said. "Is it really by the people, of the people, for the people, or by the party high command, of the party high command, for the party high command?"